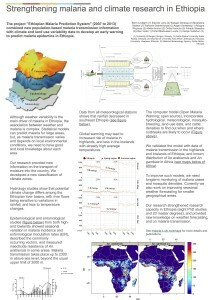 Korecha, D., and A. Sorteberg (2013), Validation of operational seasonal rainfall forecast in Ethiopia, Water Resour. Res., 49, doi:10.1002/2013WR013760. 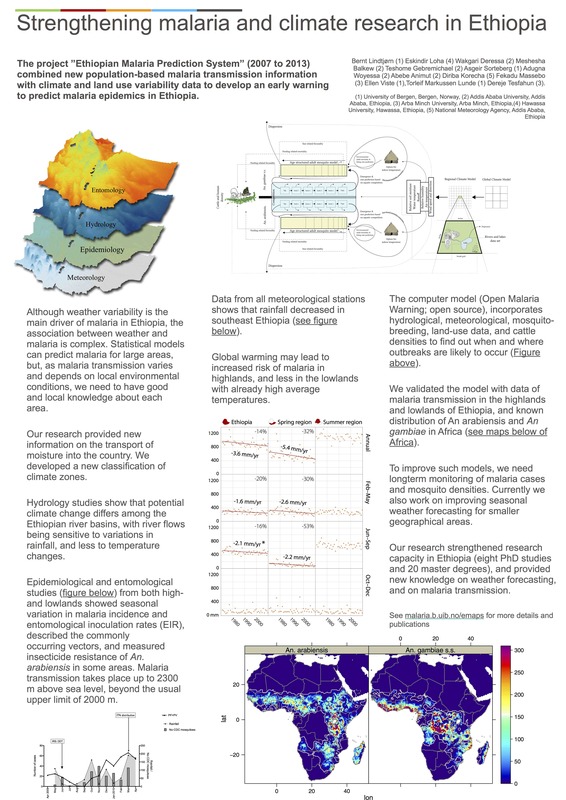 Operational rainfall forecasts using the analog method have been issued in Ethiopia since 1987. We evaluate the performance of the forecast system for February–May and June–September rainy seasons over the period 1999–2011. Verification is performed using rainfall data obtained from Ethiopian meteorological stations covering eight homogeneous rainfall regions used in the forecasts. The results reveal that forecasts issued by the National Meteorological Agency (NMA) of Ethiopia, for the past 12 years have a weak positive skill for all eight regions compared with climatology. In terms of ranked probability skill scores, the values are all lower than 10% indicating that the forecast skill is modest. The results further suggest that the forecasting system has bias toward forecasting near-normal conditions and has problems in capturing below average events. In contrast, the forecast has some positive skills in ranking the wet years of February–May season, particularly over the regions where there is high seasonal rainfall variability with significantly positive rank correlations for the above average years. For the main season, however, the forecast is not able to rank wet years or dry years. The extreme low and high rainfall events are mostly missed by the forecast scheme. The results indicate rather low forecast skill for extreme rainfall events in both seasons. Generally, the results indicate that NMA’s forecasts have low but positive skill as it is common with results from other forecasting systems for the Greater Horn of Africa region. The underforecasting of dry events is the most serious shortcoming of the system. The results of this randomized trial show that screening doors and windows, and closing openings on walls and eves by mud reduced the overall indoor densities of An. arabiensis by 40%. Although screening intervention reduced indoor density of An. arabiensis at all abdominal stages, the reduction was substantially higher against unfed An. arabiensis. The intervention was based on locally bought materials, and was affordable. Massebo F, Lindtjorn B. The effect of screening doors and windows on indoor density of Anopheles arabiensis in south-west Ethiopia: a randomized trial. Malar J 2013; 12(1): 319. On Tuesday September 3, 2013, Eskindir Loha defended his PhD thesis. The title of the work is: “Variation in malaria transmission in southern Ethiopia: The impact of prevention strategies and a need for targeted intervention”. In Ethiopia, 60 per cent of the population is at risk of malaria. The transmission of the disease is unstable, and hence, the possibility of epidemics demanded continuous vigilance and preparedness of the health system. Meanwhile, the complexity of the transmission of the disease has become an impediment to retain the effectiveness of prevention and control strategies. Understanding factors that play role in disease transmission at different locations, the pattern of disease transmission, the impact of prevention and control strategies and challenges in control efforts were deemed crucial for the way forward. This thesis analysed the local variations in the link between potential determinants of transmission – meteorological factors and malaria incidence. For this, we used datasets from 35 locations found in the Southern Nations and Nationalities People’s Region and registered within the period 1998 to 2007. The findings implied that the variability in the models to be principally attributed to regional differences, and a single model that fits all locations was not found. Although there is a biological link between meteorological factors and malaria transmission, the link is affected by local conditions and non-meteorological factors. With the understanding of a need to incorporate non-meteorological factors, in an attempt to predict disease incidence, a detailed investigation was carried out in Chano Mille Kebele – one of the malarious Kebeles of Arba Minch Zuria district, Gamo Gofa zone, south Ethiopia. A prospective cohort study was conducted for two years with a weekly visit to each of 1,388 households. The findings showed that rainfall increased and indoor residual spraying with Deltamethrin reduced falciparum malaria incidence. Higher disease incidence was observed among males, children 5–14 years old, insecticide-treated net non-users, the poor, and people who lived closer to vector breeding site. Meanwhile, we identified spatio-temporal clusters of high disease rates within a 2.4 sq.km area of the Kebele. Mass distribution of insecticide-treated nets neither showed community-wide benefit nor influenced the spatio-temporal clustering of malaria, though proved to be protective at the individual level. Further analysis on insecticide-treated nets showed that the proportion of insecticide-treated net use reached a maximum of 69 per cent despite a near universal coverage (98.4 per cent) was achieved. Sleeping under the insecticide-treated nets was influenced by gender, age and proximity to the vector breeding site. Factor compromising the usable life of insecticide-treated nets and a lack of convenient space to hang more than one net were reported. The local variations in meteorology-malaria link, the heterogeneous risk carried by different population segments and the observed effect of prevention strategies may help to revisit the approaches towards malaria – for which I forwarded specific recommendations. Torleif Markussen Lunde defended his PhD thesis on Monday August 19, 2013. The title of the thesis is: «On the dynamics of two efficient malaria vectors of the Afrotropical region: Anopheles gambiae s.s and Anopheles arabiensis». Weather and climate are only some of the factors influencing the dynamics of malaria. With the ongoing debate on the consequences of climate change, there is a need for models which are designed to address these questions. Historically, models have fo- cused on the theoretical principles of eradication, with less emphasis on a changing environment. To estimate the potential impact of climate change on malaria, we need new models which consider a wider range of environmental variables. In this thesis, we point at some factors which are important to robustly project the influence of climate and weather on malaria. These factors are described using a math- ematical model which focus on the weather sensitive parts of malaria transmission; the mosquitoes and the parasites. Mosquitoes transmitting malaria belong to the genus Anopheles. There are about 460 known anophelines, where 41 are considered to be dominant vectors of malaria. Each of these species have its own life history, and consequently weather and climate influence each species differently. In Africa, the public health impact of malaria is dev- astating, despite variable transmission. The most efficient mosquitoes are found in this continent: among them Anopehels gambiae sensu stricto and Anopheles arabiensis, which are considered to be of major importance. In this thesis (Paper I) we describe a dynamical model which include these two species. Based on a literature review, we formulate a model which allows weather to influence each of the two species according to their life history. They compete over puddles, important for reproduction; An. gambiae s.s. mainly feed on humans op- posed to An. arabiensis which feed on cattle and humans; they are allowed to disperse, meaning new ares can be occupied by the species; and as they become older, the daily probability of survival changes. Many of these factors are not important in a short time perspective. But, since climate change is slow process compared to the life of a singe mosquito, there is a need for additional complexity to study how a slowly changing en- vironment influence the population dynamics of these malaria vectors. To have confidence the model is realistic in the current climate we validated the model in paper II. To date, we constructed the most extensive database on the occur- rence of the two mosquitoes. These data were used to validate the model described in paper I. We concluded the mosquito model produced comparable or better results than existing predictions of the two species under current climate. An. arabiensis feed on humans and cattle. Since the density and distribution of ￼those are not static, but are changing over time, and the distribution of An. arabiensis is highly dependent on the density of cattle, there is a need to; 1. Document histori- cal changes; 2. Understand how they are influenced by the environment. In paper III we reconstruct the cattle distribution and density in the 1960s, and show how climate variability influence the national cattle holdings. While climate variability has a minor influence in many countries, we also find variations in the climate can explain more than 40% of the national cattle holdings in some countries. The data developed in this paper can be used in the model described in paper I, as well as other studies where cat- tle is an important part of the system. It has been claimed the optimal temperature for malaria transmission is between 30 to 32◦C, with the potential increasing linearly from 20 to 32◦C. With this claim, any warming in sub-Saharan Africa would potentially cause more malaria. Using the model developed in paper I, we show malaria transmission is most effective around 25◦C, with a decline in efficiency over end below this temperature (Paper IV). This disputes the theory claimed in previous papers. Any projections relating temperature and malaria should be interpreted with care. The influence of climate change on malaria transmission is still uncertain. With this thesis, we have come a step further in understanding how the environment can alter malaria transmission. However, the future occurrence of malaria is dependent on many other factors, including malaria control measures, access to and usage of treatment, city planning, and immunity. Analysis of risk factors for malaria in the highland fringe areas of southern Ethiopia. . Using a multistage sampling technique 3,398 people were sampled from 750 households. Results suggest that younger age, lower altitudes, and houses with holes were significant risk factors for malaria infection in this population. Woyessa A, Deressa W, Ali A, Lindtjørn B. Malaria risk factors in Butajira area, south-central Ethiopia: a multilevel analysis. Malaria Journal 2013, 12:273. The highlands of Ethiopia, situated between 1,500 and 2,500 m above sea level, experienced severe malaria epidemics. Despite the intensive control attempts, underway since 2005 and followed by an initial decline, the disease remained a major public health concern. The aim of this study was to identify malaria risk factors in highland-fringe south-central Ethiopia. This study was conducted in six rural kebeles of Butajira area located 130 km south of Addis Ababa, which are part of demographic surveillance site in Meskan and Mareko Districts, Ethiopia. Using a multistage sampling technique 750 households was sampled to obtain the 3,398 people, the estimated sample size for this study. Six repeated cross-sectional surveys were conducted from October 2008 to June 2010. Multilevel, mixed-effects logistic regression models fitted to Plasmodium infection status (positive or negative) and six variables. Both fixed- and random-effects differences in malaria infection were estimated using median odds ratio and interval odds ratio 80%. The odds ratios and 95% confidence intervals were used to estimate the strength of association. Overall, 19,207 individuals were sampled in six surveys (median and inter-quartile range value three). Six of the five variables had about two-fold to eight-fold increase in prevalence of malaria. Furthermore, among these variables, October-November survey seasons of both during 2008 and 2009 were strongly associated with increased prevalence of malaria infection. Children aged below five years (adjusted OR= 3.62) and children aged five to nine years (adj. OR= 3.39), low altitude (adj. OR= 5.22), mid-level altitude (adj. OR= 3.80), houses with holes (adj. OR= 1.59), survey seasons such as October-November 2008 (adj. OR= 7.84), January-February 2009 (adj. OR= 2.33), June-July 2009 (adj. OR=3.83), October-November 2009 (adj. OR= 7.71), and January-February 2010 (adj. OR= 3.05) were associated with increased malaria infection. The estimates of cluster variances revealed differences in malaria infection. The village-level intercept variance for the individual-level predictor (0.71 [95% CI: 0.28-1.82]; SE=0.34) and final (0.034, [95% CI: 0.002-0.615]; SE=0.05) were lower than that of empty (0.80, [95% CI: 0.32-2.01]; SE=0.21). Malaria control efforts in highland fringes must prioritize children below ten years in designing transmission reduction of malaria elimination strategy. Massebo F, Balkew M, Gebre-Michael T, Lindtjorn B. Entomologic Inoculation Rates of Anopheles arabiensis in Southwestern Ethiopia. Am J Trop Med Hyg 2013. We collected anophelines every second week for one year from randomly selected houses in southwestern Ethiopia by using Centers for Disease Control (CDC) light traps, pyrethrum spray catches, and artificial pit shelter constructions to detect circumsporozoite proteins and estimate entomologic inoculation rates (EIRs). Of 3,678 Anopheles arabiensis tested for circumsporozoite proteins, 11 were positive for Plasmodium falciparum and three for P. vivax. The estimated annual P. falciparum EIR of An. arabiensis was 17.1 infectious bites per person per year (95% confidence interval = 7.03–34.6) based on CDC light traps and 0.1 infectious bites per person per year based on pyrethrum spray catches. The P. falciparum EIRs from CDC light traps varied from 0 infectious bites per person per year (in 60% of houses) to 73.2 infectious bites per person per year in the house nearest the breeding sites. Risk of exposure to infectious bites was higher in wet months than dry months, with a peak in April (9.6 infectious bites per person per year), the period of highest mosquito density. The full text is found here.